Text messaging has become a mainstream form of communication. Now, customer service industry is focusing on the chatbots – the next big thing for information management and customer service. A chatbot is a program simulating a real conversation that you participate in via a chat interface. The application of bots can be really wide, varying from functional to fun and it can be implemented in any major chat product like Facebook Messenger, Telegram, Slack, text messages, etc. Chatbots have the ability to interpret human speech or writer inquiries and decide which information is being sought. Sometimes you might not realize it, but when it comes to buying tickets, hailing Uber, or ordering tacos, chances are high that there’s a chatbot living in your messaging app. How can chatbots help your business exactly? Waiting for support is the worst nightmare for any customer. Chatbots can mitigate customer service agents, by helping with basic, repeatable customers’ queries that often appear in the FAQ section. A customer service rep can step in later to handle more complex tasks when needed. Let’s say a customer asks a popular query “When will my item be delivered?” You can prepare an answer and instruct a chatbot to reply with it so that live agents can focus on more demanding issues. Thanks to this, customers don’t have to wait for an agent to respond. Chatbots answer the most commonly asked questions instantly. Mark Armstrong, managing director of EMEA at IT development firm Progress, says we have been interacting with bots for years, but they’re quickly advancing. “Bots, specifically chatbots, are being hailed as the next big thing, replacing the need for downloadable apps. Integrated into an already viable platform, a bot can do things that a normal human chat wouldn’t necessarily be able to accomplish easily, like check the local weather, order pizza, or hail a cab,” says Armstrong. For example the whole experience of ordering from Taco Bell is much faster now. 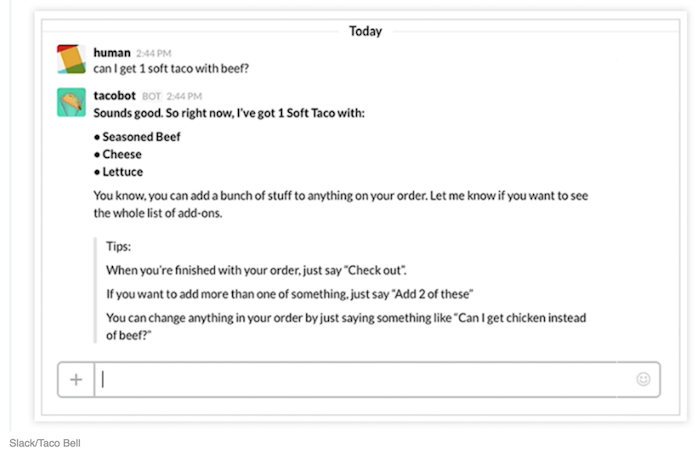 Taco Bell has teamed up with Slack to launch “TacoBot” that allows users to order food in the instant–messaging application used by companies for internal communication. The feature is currently being tested by a number of companies including Giphy, Fullscreen, and FoodBeast. Thanks to chatbots, food ordering proceeds more swiftly now. Basically, customer service is more efficient and customers get a higher quality of service. Besides providing weather and content updates (Wall Street Journal and Tech Crunch) tailored to person’s preferences, chatbots may assist customers with complex purchasing decisions. When a customer is looking for a particular product, a chatbot can search a product catalogue and make personalized recommendations for a customer. Let’s say a customer tells a chatbot they’re looking for brown or black boots and made from suede leather. The chatbot can then pull items with proper details for the customer. Once a customer decides to make a purchase, the entire sales transaction may be handled by chatbots as well. Many companies want to make sure they provide a balance between automation and human assistance, therefore, they ensure that customers have access to human agents as well. If a customer is not ready to make a decision at this point, all is not lost yet, because this process is not a one time experience. Next time this customer interacts with chatbots, they will remember former conversation and preferences. More and more people shop using their mobile devices. However, when it comes to making a purchase, they switch to a stationary device. Everything looks more clear and there is easy access to support. This causes many customers to be frustrated about the lack of mobile optimization. We all know the pain. Chatbots are meeting these needs, as they eliminate the necessity to contact a company for additional support. They allow customers to begin and finalize a transaction within a chat interface or a single messaging app. 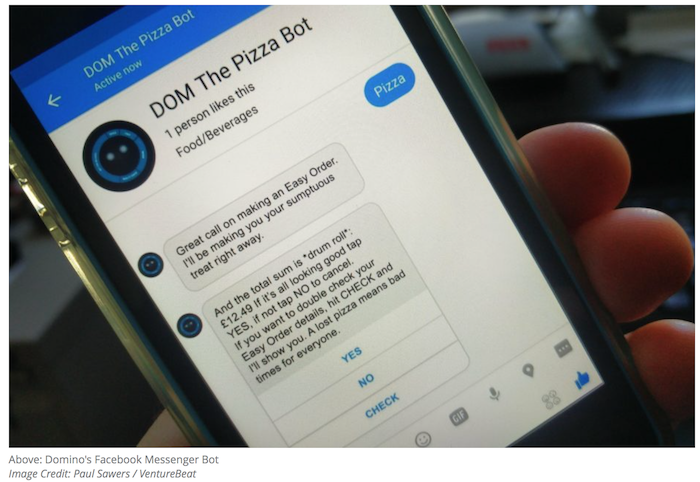 Domino’s Pizza is a company that recently embraced the full potential of the bot revolution with the launch of a pizza-ordering bot for Facebook Messenger. According to the press release, “Dom” is praised as an “artificially intelligent customer service whiz” and expands the company’s existing “Easy Order” service to the world’s most famous and popular messaging app. Easy Order is Domino’s online feature that lets users order their favourite thing with the tap of a button within the mobile app or through an Apple Watch. All you have to do is pair your Facebook account with your Domino’s account, type “PIZZA” to the Messenger bot, and that’s it. Easy Order automatically selects the pizza based on your ordering history, or you can manually configure your preferred pizza within your account interface. What we’re missing here is the possibility to personalize or tailor the order, like “I want extra cheese to it.” Here’s how it looks like. Many believe chatbots will revolutionize customer service as we know it. They can also increase sales. By creating an automated conversation that’s tailored to a new visitor, they can be a first point of contact with the customer and provide immediate and personalized support. Depending on the business you’re in, they can guide a customer even through the whole buying process. Thanks to that, customer service agents will have more time to solve complex issues. 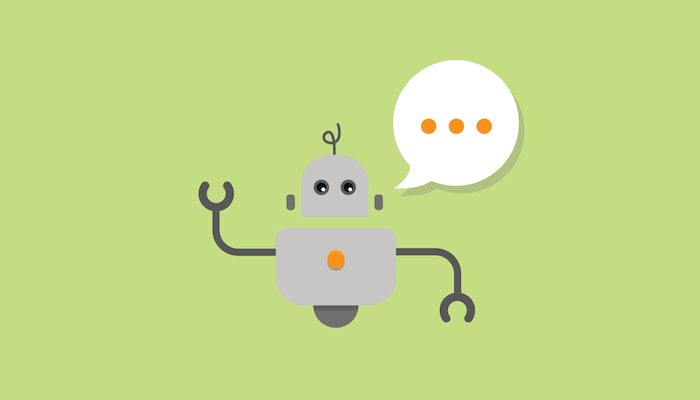 While there is plenty of room for improvement, chatbots are a great addition to customer service and ecommerce, and we should see growth in this area of automation.